28 March 2015, at 12:00a.m. Recent research at the University of California-Davis shows that, compared to conventional battery cages, a dozen eggs cost 13 per cent more to produce when hens are housed in enriched cages and 36 per cent more when they are kept in aviaries. University of California-Davis researchers, William Matthews and Daniel Sumner have published what they believe to be the first publicly available egg production costs comparing three laying hen housing systems in the United States. They report in Poultry Science that they collected detailed data from two flock cycles from a commercial egg farm operating a conventional barn with battery cages, an aviary and an enriched colony system at the same location. The farm employed the same operational and accounting procedures for each housing system. 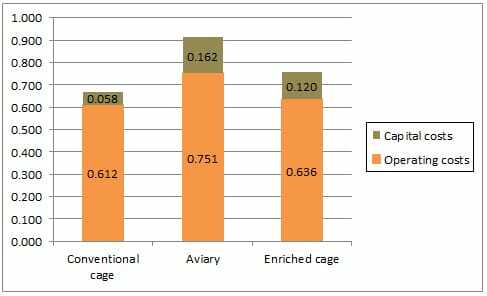 They found clear evidence that egg production costs are much higher for the aviary system than the other two housing systems (Figure 1). 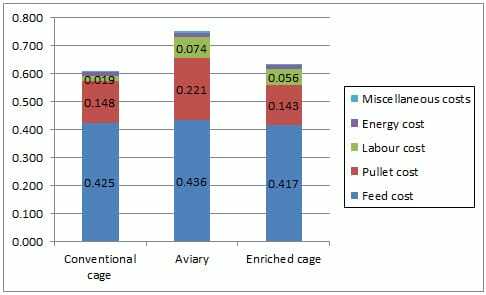 Feed costs per dozen eggs are somewhat higher for the aviary and lower for the enriched house than the conventional house. Labour costs, however, were much lower for the conventional house than the other two, and pullet costs are much higher for the aviary. Energy and miscellaneous costs are a minimal part of total operating costs and do not differ by housing system. Total capital investments per hen-capacity are much higher for the aviary and the enriched house than for the conventional battery house. Capital costs per dozen eggs depend on assumptions about appropriate interest and depreciation rates. Using the same 10 per cent rate for each housing system shows capital costs per dozen for the aviary (at 16.2 cents) and the enriched housing system (12.0 cents) are much higher than for the conventional battery house (less than 6 cents), as shown in Figure 2. The aviary had average operating costs – covering feed, labour, pullet, energy, and miscellaneous costs that recur for each flock and vary with egg production – about 23 per cent higher and average total costs about 36 per cent higher than the conventional battery house. The enriched housing system has average operating costs only about four per cent higher than the conventional battery house but average total costs are 13 per cent higher than for the conventional house. Matthews W.A. and D.A. Sumner. 2015. Effects of housing system on the costs of commercial egg production. Poultry Science. 94:552-557.